Trevonn Kidd came to the YMCA Phoenix School as a result of some poor decisions he made that got him in trouble. He was planning to drop out of school and really didn’t care about anything. He’d heard bad things about the Phoenix School and was just going to try to make it through. Soon after enrolling, he realized the staff genuinely cared about him and that they weren’t out to get him. The staff was there to provide him with the support he needed to change. Trevonn came to understand that his future was dependent on learning to follow rules. While at the Phoenix School his home life improved, too. He had been very disrespectful to his mother and realized he was wrong. It’s been a long road for Trevonn. During some very dark times, he made choices that took away his chances at playing high school basketball and possibly getting a college scholarship. Getting to know other Phoenix School students helped Trevonn realize his life wasn’t as bad as he thought. Hearing their stories helped him see the truth about living a life with no regard for rules or consequences. Some of them had made really poor choices and he saw the reality of their consequences. “I started to take ownership of my choices and found myself wanting to change for the better,” Trevonn continued. Thanks to a determined spirit and support from individuals who truly cared about him, Trevonn graduated, is involved in a job- training program, and is considering enrolling in a two-year post secondary program. He’s happy he had a chance to get back on track, hopeful about building a brighter future, and ready to go after his dreams. 88% developed positive relationships with adults. 86%	developed positive relationships with peers. 86%	established stability in their living /school environment. 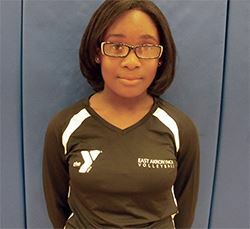 London Green has been a member of the youth volleyball team at the East Akron YMCA since its inception. She has developed a true passion for the sport! According to her mother, participating in the East Akron YMCA’s youth volleyball program has been a great experience for London. She enjoys meeting new people and has made many new friends. London is passionate about the sport, practices at home and wants to participate in the program even when her friends are not able to attend. 97% reported a positive impact on their spirit, mind and body. 94% reported developing a passionate interest. 97% reported enjoying social interaction. At the East Akron YMCA’s 2011 Thanks for Giving Dinner, Kathleen, a 1988 Phoenix School participant, expressed her gratitude to the staff and supporters of the Phoenix School and shared the positive impact they have had on her life. Kathleen returned to her home school, received her GED and specialized training in medical assisting and has been gainfully employed in the medical assisting field since. 95% develop positive relationships with adults. 95% learn to work effectively with others. 92% develop positive relationships with peers.